The choice of decor, the style of service and the level of comfort are all critical elements in creating the ultimate dining experience. Yet there is one key component that can influence not only what people eat, but entice them enough to try something they would never, otherwise. The days of a simple Menu, outlining what food and beverages you have to offer, are long gone. Nowadays, savvy diners come well-equipped to try the biggest, baddest and fanciest dishes they've seen on Social Media, as opposed to taking the time to understand what your unique business has to offer. It's difficult to find a Menu which communicates a brand story, the inspiration behind dishes and the enticement of trying something new. Menu's that we utterly get excited about are, actually, complex and strategically tailored pieces of writing designed to get your taste-buds tingling. Majority of the time, however, it's a mix of both psychological and marketing ploys to ensure the menu is on-brand, easy to read, and most importantly, profitable. So while you're contemplating on what you're about to have breakfast, lunch or dinner, 'menu engineers' (yes, they are a thing!) are secretly influencing what you're about to devour. Menu engineers study the visual and verbal psychology behind the diner's decision-making; and using this information to design menus to maximise the restaurants profits, and to get you salivating. Here, we'll explore the hidden secrets behind the aesthetic structure of the restaurant menu to get your customers ordering more. According to a US poll, diners spend an average of just 109 seconds scanning a menu quickly, rather than reading the menu front-to-back. Menu engineers identify areas of the menu that are 'prime real estate' - the parts of the menu where people look at first in that span of 109 seconds. Because, really - the menu literally has little-to-no time to make a big impact on the diner. 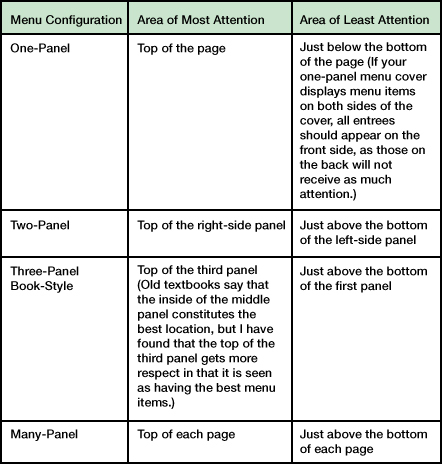 Customers spend the most time looking at the first and last items of the menu. Clear section headings, easy-to-find dish titles and utilising 'prime real estate' spots is a good way to start generating big sellers. We don't expect you to hire out some researchers to do analyse the reading patterns of your diners. Research tells us that eyes tend to gravitate towards the upper right-hand corner of the menu first; otherwise known as the 'sweet spot'. This is often why many restaurants place the menu item they want to sell the most in this particular location. Graphics and a tasteful illustration, complimented with a large, and bold typography can help highlight and draw a hungry eye to the sweet spot. It's exactly what it sounds like - an eye-magnet is defined as anything that will attract the eye. Decorative border frames, graphics or even a photo of a dish can act as an eye-magnet to encourage your diners to order from a particular section of the menu. However, it's important to note that we can't have too much of a good thing. Gregg Rapp, menu engineer, said that the more often you use eye magnetics, the less impact it will have. It is recommended that highlighted items should be limited to one per category or section such as your appetizers, mains, desserts, etc. 4) Use colour to influence emotion in your diners. People respond to colour in emotional ways, often subconsciously. For restaurant menus, red and blue are thought to help trigger appetite, and attract attention to certain areas or 'sweet spots' in the menu. A blue accent is especially appropriate for seafood-centric restaurants; tying to 'ocean-freshness' that we all know and love. 5) Don't dismiss the power of Descriptive Language. Phrases on your menu must be appealing, as much as it is appetizing and heavenly to eat. For example, a study found that extra descriptors (such as "succulent Italian seafood fillet" vs. "seafood fillet") resulted in diners experiencing much more satisfaction in their meal. All in all, time and effort should be spent crafting dish titles that are tempting to the eye, and watering to the mouth. Tune in next week for Part 2 of this article! Here at Gispac, we strive to understand your business needs and deliver packaging that sets you apart, just like these influential Aussie brands. Please join us on Facebook, Instagram or Pinterest to explore the very best of packaging across all industries.